A large-scale analysis of almost 51,000 exomes of patients and their electronic health records (EHRs) revealed clinically actionable variants in 3.5% of individuals, as well as a number of known and potential drug targets. The study also demonstrated that exome sequencing can identify individuals at risk of familial hypercholesterolemia (FH). The work was done by the Regeneron Genetics Center and the Geisinger Health System. The data set from the DiscovEHR study “provides a blueprint for large-scale precision medicine initiatives and genomics-guided therapy discovery,” corresponding authors Frederick Dewey from Regeneron and David Carey from Geisinger and their colleagues wrote in a publication of the first study results in Science. A separate Science paper, led by corresponding author Michael Murray from Geisinger, focused on the analysis of individuals at risk of FH. The researchers sequenced the exons of 18,852 genes in 50,726 patients who had consented to participate in the Geisinger MyCode Community Health Initiative, a precision medicine project that includes a system-wide biobank designed to store blood and other samples for research use. Among the individuals with clinically actionable variants, 65% had clinical features in their EHR that were consistent with the predicted disease, but only 14% had a formal diagnosis, and another 53% had diagnoses consistent with clinical features of the disease. Thus, the results “demonstrate the potential for genomics-guided clinical care in a largely unselected clinical population,” the authors wrote. In their second publication, the researchers honed in on FH, which remains underdiagnosed and is associated with coronary artery disease and stroke. FH is mostly caused by mutations in the genes LDLR, APOB, and PCSK9. Overall, they found 35 known and predicted pathogenic variants in those three genes in 229 individuals, translating to a disease prevalence of 1:256 in this cohort. Before genetic testing, only 15% of the FH variant carriers had a diagnosis for hypercholesterolemia or had been seen in a lipid clinic, and only 24% of carriers would have qualified for such a diagnosis on the basis of their clinical EHR data. 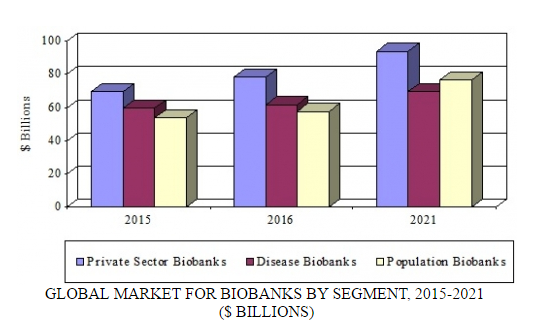 The global market for biobanking is expected to increase from $198.2 billion in 2016 to $240.2 billion in 2021, demonstrating a five-year compound annual growth rate (CAGR) of 3.9%. The private sector (i.e., biobanks owned by research foundations, private hospitals, biotechnology and pharmaceutical companies, and other commercial interests associated with the biobank industry) is projected to reach $78.5 billion and $93.7 billion in 2016 and 2021, respectively, reflecting a five-year CAGR of 3.6%. The sector that is predicted to experience the most growth is population biobanking (where samples represent a particular population), which is anticipated to attain $76.7 billion in 2021, up from $57.8 billion in 2016, at a five-year CAGR of 5.8%. New population-based biobanks are emerging worldwide. Disease biobanks, which source samples from individuals with particular diseases such as heart failure and cancer, will grow at a five-year CAGR of 2.4% and increase to $69.8 billion by 2021. The modern biobanking industry has enlarged in scale and scope, with an increased volume of samples analyzed in laboratories and a wider variety of research topics that can be handled, as a result of the falling costs of genomic technologies. The expansion of the middle class in emerging countries such as Brazil, India, Russia, and China is also expected to drive growth in the biobanking industry. Other growth factors include the need to reduce healthcare costs; the increased availability of modern research equipment, technologies, and facilities for sample collection and storage; and advancements in biobanking techniques. BCC Research’s recent study, Biobanking: Technologies and Global Markets, analyzes emerging technologies, players, and changing market dynamics. To enable resource allocation and effective decision making, strategies for accessing particular geographies, disease segments, and emerging markets are examined. Global market drivers and trends, with data from 2015, estimates for 2016, and projections of CAGRs through 2021, are provided.